Back-to-School Breakfasts - Energetic Juniors - Contact Us! Mom was right when she told you breakfast is the most important meal of the day! Studies show that children and teens who eat breakfast daily perform better in school, are more likely to be physically active, and are more likely to be able to maintain a healthy body weight. They also tend to have overall healthier diets. Breakfast jumpstarts your day, giving your body fuel to maintain its energy throughout the morning. Prepare the night before by laying out your child’s clothes, packing their bags, and setting the breakfast table. Leave the television off while children are getting ready and having breakfast—you may not realize it but it’s a major distraction! Make sure your kids are getting adequate sleep. Sleep deprivation can make children feel nauseous and bloated in the morning, making them not want to eat breakfast. If you usually have time on the weekends to make a bigger breakfast, make an extra batch and freeze the leftovers for weekday breakfasts. For example, make an extra batch of whole wheat pancakes, waffles, or muffins for quick and easy weekday breakfasts. Mix ¾ cup whole grain cereal with ¼ cup no sugar added dried cranberries, 10-15 nuts and 2 Tbsp dark chocolate chips in a small Ziploc bag. Take to go with an 8 oz. container of milk. Beat 2 eggs in a microwave safe bowl or large mug. Add 3 tsp of milk, salt and pepper to taste. Microwave on high for 2 minutes. Stir and cook for an additional 1 ½-2 minutes on high. Scoop onto a whole wheat sandwich thin, tortilla or English muffin. Spread 1 Tbsp of natural sunflower seed or nut butter on a whole wheat tortilla. Top with 1 sliced banana and a sprinkle of cinnamon. Fold in half and take to go. Drain liquid from a 6 oz. container of yogurt. 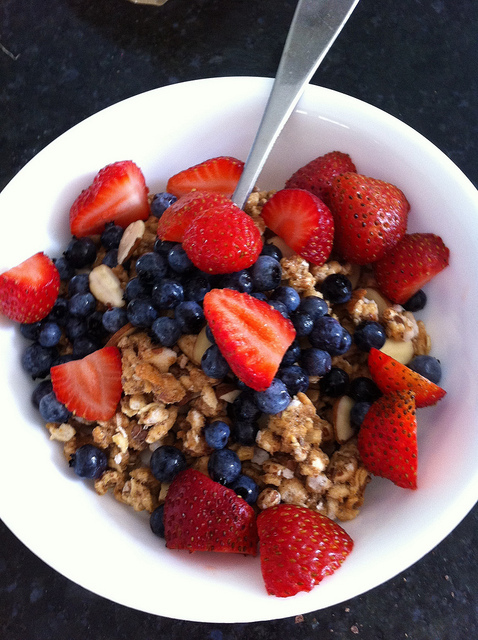 Add a few teaspoons of fresh berries and granola and mix. Cut a slit in the lid, just big enough to slide in a popsicle stick. Put the lid back on and freeze. Unmold when ready to eat, but leave the lid on the bottom of the pop to catch drips! While a whole grain waffle is toasting, mix together blueberries, blackberries, raspberries or any other chopped fruit you have on hand. Fold waffle into a “taco” and fill with the mixed fruit. Top with a dollop of yogurt. Combine 1 cup milk or yogurt, 1 frozen banana 1 Tbsp of sunflower seed or nut butter, and a sprinkle of cinnamon in a blender. Blend until smooth. Melt 1 slice of part skim mozzarella cheese on ½ of a whole wheat English muffin. Top with 1 large tomato slice and the other half of the muffin.